Do you need the best bathroom installation? Inject personality into your bathroom with BST Bathrooms today. With years of experience in the industry, we have provided the best bathroom installation Hampshire service for many years. Whatever the request, BST Bathrooms will complete all bathroom installations to the highest standards. Whether it is a refit of the whole bathroom, to a new design or more, BST Bathrooms have years of experience in fitting, designing and supplying bathrooms of all different sizes and shapes. If you require a simple bathroom suite installation service, we install bathroom suites from any manufacturer or DIY store. View more information about our bathrooms. Wet rooms are a great addition to any home and will make your property stand out from the rest on the market. All of our wet rooms are tailored to your bathroom, and our expert team will ensure that your wet room is fully sealed and drain water effectively. Do you want to save money on bathing? Call BST Bathrooms today for your quotation on our shower installations for your Hampshire bathroom. Baths are notorious for taking up a huge amount of space in most bathrooms and are a reason for cramped and claustrophobic bathrooms. Call BST Bathrooms today on 023 8045 3112 or 07968 347 241 for the best Hampshire bathroom installation. Is your bathroom the most outdated room in your home? Would you like to update your bathroom with all of the modern conveniences? BST Bathrooms can provide your home in Hampshire with a new bathroom that is tailored to meet all of your needs and requests. Our company has over 20 years of experience in providing the best services Hampshire has seen, and we are dedicated to providing quick and high-quality installations. Bathrooms are often ignored by many homeowners despite research showing that we spend a considerable amount of time in the bathroom. We can fit bathroom suites on your request or design a customised bathroom to meet all of your needs. BST Bathrooms can also provide a wide range of fittings and great features such as power showers that will help revolutionise the bathroom experience for your household. BST Bathrooms can undertake a wide range of bathroom related services upon your request. So whether you require carpentry works, plumbing, electrical or other installation work, look no further than BST Bathrooms. We can also arrange a wide range of tiling options for your home including ceramic, marble, granite and limestone. Additionally, we are able to install features such as ensuites bathrooms. Our company has years of experience in installing and delivering a wide range of disabled bathrooms for our customers. 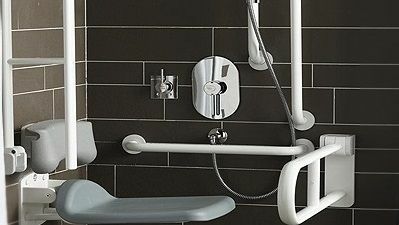 All of our disabled bathrooms are fully customisable to suit the needs of each and every one of our customers. We are more than happy to completely refurbish your bathroom or install the relevant accessories you need. BST can install the following: grab rails, anti-scald valves, shower seats and easy-access bath tubs. All of our disabled services will be done in accordance to Document M standards. Do you find that you never use the bath in your bathroom? Have you thought about updating your bathroom so that it has the latest modern shower? We can install and cater a shower room to meet all of your needs and requests. Having a shower room in your home will present many benefits for you and your household. A shower is a far more economical method of washing than bathing and will help to save money on bills. It will also allow you to wash quicker than before. Showers take up less room than a bath which is handy for customers who have a cramped bathroom. We have a great range of designs to suit everyone. Do you want a stylish bathroom that is all-inclusive? A wet room is a wise investment that will add a chic edge to your home and make it stand out from all the others. Our trained plumbers and bathroom installers will ensure that your bathroom is levelled and angled so that the water drains effectively. We also install tiles that are designed to prevent slips of any kind so that you have peace of mind after showering. Our company has years of experience in providing only the best bathrooms Hampshire has experienced, and we are dedicated to ensuring our customers get the most out of their bathroom. By choosing BST, our customers will be able to take advantage of our multi-skilled workforce that will allow you to deal with one company and one company alone. When you choose our services, you will be given a fixed quotation that will be inclusive of all services and will not have any hidden extras unless specified. Our teams are wholly flexible, and we are able to arrange installations to suit your schedule 24/7. For examples of our previous work, click on the following link for our gallery. For more information on our great Hampshire bathrooms service, please call us today on 023 8045 3112 or 07968 347 241 or you can email our staff on info@bst-bathrooms.co.uk.